Eleven people were killed in the Sudanese capital Khartoum on Tuesday, including six members of “state forces”, the government’s spokesman said on Wednesday, as protesters pushed for an end to President Omar al-Bashir’s 30-year rule. The protests are the most sustained challenge Bashir has faced in his three decades in power. The Defence Ministry is in a compound that also houses Bashir’s residence and the NISS headquarters. The government spokesman and Information Minister Hassan Ismail said the Khartoum state police chief had delivered a report stating that 11 people had died in “incidents yesterday (Tuesday), including six members of the regular forces”. He gave no further details on how they died. Ismail also quoted the police chief as saying the authorities had foiled a “criminal plot” to burn down some police stations in some parts of the capital. NISS warned in a statement that it had detected “negative developments” towards vandalism, theft and terrorising innocent people and said it was ready to act. “The service calls on honourable citizens to be careful of attempts to drag the country towards a complete security breakdown,” the statement said. It added that it was able to “rein in the unruly elements through good advice or by force within the limits of the law”. The head of the main opposition Umma Party, Sadiq al-Mahdi, said on Tuesday that around 20 people have been killed and dozens wounded in dawn attacks on the sit-in outside the defence ministry since it began on Saturday. Soldiers were heavily deployed around a sit-in outside the Defence Ministry on Wednesday, as several thousand protesters danced, sang and chanted slogans calling on Bashir to step down. Some watched soccer matches on giant television screens mounted on special trucks. 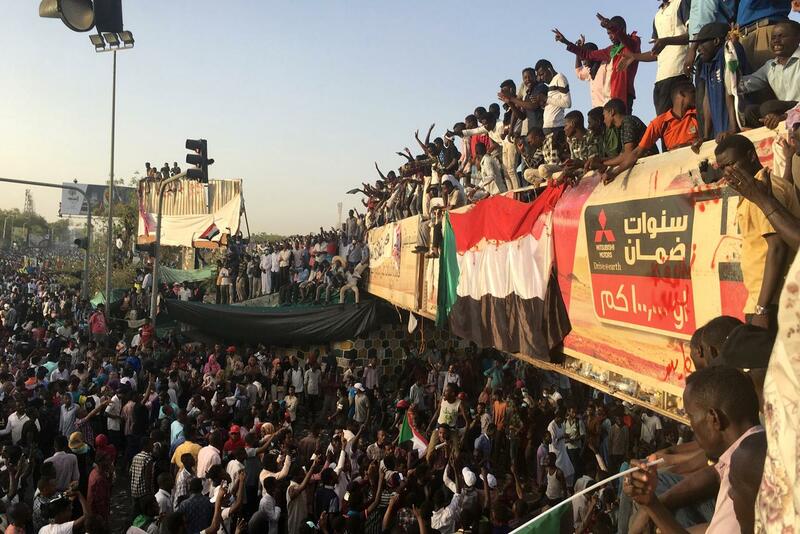 The demonstrators have been camped outside the compound since Saturday in an escalation of protests that have shaken Sudan since December. Sudan’s Health Ministry reported that Khartoum hospitals had treated 72 cases of people suffering from tear gas and 16 minor injuries. First aid vehicles were stationed near the protest site to deal with emergency cases, it said. There were no reports of attempts to disperse the protests on Wednesday. The sit-in area had expanded slightly, with hundreds of people entering and leaving despite temperatures rising above 40 Celsius (104 Fahrenheit), a Reuters witness said. Some people blocked streets to the east of the compound with stones. Protesters chanted “Fall, that’s all!”, “The people want to build a new Sudan”, and “Our army protects us”. Military trucks and troops were deployed around the compound, stopping cars from entering the area. Police and NISS forces appeared not to be present. Since Dec. 19, Sudan has been rocked by persistent protests sparked by the government’s attempt to raise the price of bread, and an economic crisis including fuel and cash shortages.